Julie Schmitt has been a professional dog trainer for over twenty-five years. As the only dog trainer in San Diego who is a licensed Guide Dog Mobility Instructor (GDMI), Certified Professional Dog Trainer – Knowledge Assessed (CPDT-KA) Certified Victoria Stilwell Positively Dog Trainer (VSPDT), and a Certified Fear Free Professional, Julie is one of the most experienced trainers in the San Diego region and is uniquely qualified to assist you with all your dog training needs. She is recommended by the El Cajon Animal Shelter, local veterinarians, numerous professional animal trainers and other pet professionals. She can often be found working with clients at Fiesta Island, hiking trails at Cowles Mountain, or walking at Lake Murray. Julie conducts many training sessions at parks throughout the East County, with specific emphasis on such neighborhoods as Del Cerro, Rolando, San Carlos, Santee, El Cajon, La Mesa, and Lakeside. 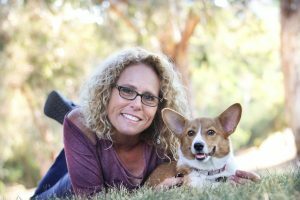 Julie’s goal is to educate dog owners that having well-behaved dogs is a life-long process that can be enjoyable, rewarding and easily achieved. She will give you the tools to begin this process and continue to guide you along the way. She employs positive dog training methods because they are scientifically proven to be most effective and most humane. These very same practices can be applied to improve a person’s relationship with family members, friends and coworkers alike. Julie’s career began teaching basic and obedience classes at a humane society in Northern California. After working at the humane society, Julie joined Animal Behavior and Training Associates as the District Training Manager where she supervised and trained all associate dog trainers, taught obedience classes and conducted private, in-home dog training sessions. In 1996, Julie began working at the prestigious Guide Dogs for the Blind, Inc., in San Rafael, California. She completed a three year intensive apprenticeship and is a licensed Guide Dog Mobility Instructor through the State of California. With six years of hand-on experience at Guide Dogs, Julie trained over 90 guide dogs. During her tenure, she worked with over 400 dogs. She was responsible for the teaching and reinforcement of positive and humane methods of dog care; including training, daily care, administration of medications and provision of stress relief activities. 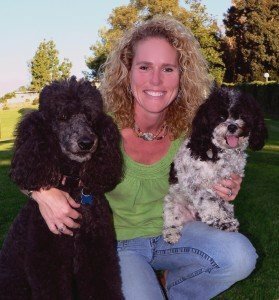 In 2002, Julie and her family moved to San Diego where she established Out N’ About Dog Training. She was privileged to be approved as a Victoria Stilwell Positively Dog Trainer by Victoria Stilwell herself, star of Animal Planet’s hit TV series It’s Me or the Dog and a passionate advocate for positive reinforcement training methods. Julie lives in La Mesa with her husband, who is a veterinarian, and their two daughters. They also have two terrific dogs, fish and a gecko. Julie has a passion for her work and a love for animals that is evident in her training style.